A Beijing consulting firm estimates the size of China’s Compass/BeiDou domestic industry was 6 billion renminbi (US$927 million) in 2010, comprising only 6 percent of the country’s GNSS market. In a news release yesterday (July 10, 2011), Beijing-based CCID Consulting Co., Ltd., described its analysis of the future evolution of China’s GNSS system at the beginning of China’s 12th Five-Year Plan period (2011-2015). Compass officials have announced plans to launch 12 more BeiDou-2 satellites by the end of 2012 to join the 8 already in orbit. According to CCID Consulting, China has about 200 enterprises engaged in the research and development activities involving Compass products, most of modest size and scattered in more than a dozen of provinces and municipalities. The growth has taken place despite the absence of an officially published interface control document for the GNSS system. With a background in the GPS industry, the Yangtze River Delta, the Circum-Bohai-Sea Region, and the Pearl River Delta are actively developing their Compass capabilities, according to CCID. As the center of the Pearl River Delta, Guangdong Province has taken a lead in promotion and application of Compass, CCID said. Guangdong Province has gathered a number of major Compass satellite navigation enterprises and research institutes. 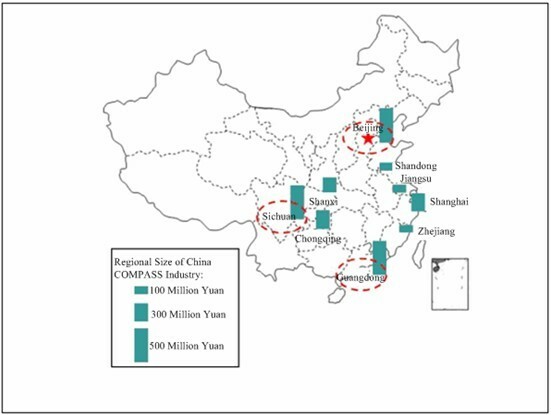 In March 2011, the Economic & Information Commission of Guangdong Province recognized the Pearl River Delta Compass Satellite Navigation System Demonstration Project as one of its important goals in its 2011 Plan for Promoting the Development of Strategic Emerging Industries. Meanwhile, Shanghai Municipality got an early start in GNSS applications and receiver manufacturing during the 11th Five-Year Plan period (2006-2010). In 2010, Shanghai set up the Pujiang National Satellite Navigation Application Base and established the Shanghai Strategic Technical Innovation Alliance of Satellite Navigation & Positioning Industry to promote commercial Compass receiver and applications development, CCID reported. At the center of the Circum-Bohai-Sea Region, Beijing has the country’s most comprehensive Compass navigation industry chain, according to CCID. The city has gathered China’s major Compass enterprises, research institutes and aerospace talents. The municipality owns a national satellite navigation industrial park, a national satellite navigation technical innovation incubator, and the Beijing Navigation Demonstration Base. Other provinces and municipalities have also been engaged in the development of the Compass navigation industry. CCID singled out Tianjin Municipality’s overall cooperation agreement with the National Satellite Navigation Information Service Center in March 2011 to introduce civilian projects of Compass satellite navigation; Shandong Province’s construction of a Compass industrial park in the Jiaozhou Bay Industrial Area in February 2011 at an estimated cost of RMB 3 billion (US$463 million); and Hebei Province’s expansion of Compass activities with the strong R&D capabilities of the No. 54 Institute of China Electronics Technology Group Corporation. CCID predicts that the Compass industry will move to spread throughout China and supplant the GPS industry there. The country is currently building four Compass operational centers in Beijing, Shanghai, Chongqing and Xian. In the upstream sectors, Beijing will serve as the center of basic Compass technology research and standards development, while Shanghai will be the upstream chip design and manufacturing center. As for downstream industries, CCID points out that Compass is mainly used in maritime, telecommunication and power time dissemination and emergency rescue, but predicts that civilian applications will soon become the largest sector of the industry. Meanwhile, the operation services will see multiple operators active in each regional market to serve the local customers. 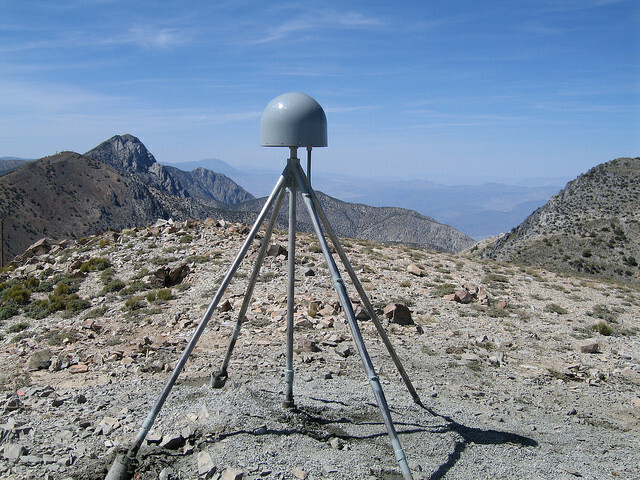 GNSS Charts Drought-Driven Tectonic ‘Uplift’ in Western U.S.